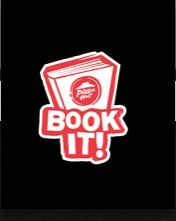 We did the Pizza Hut Book It program two years ago and we started it this past year but then I did a TERRIBLE job of keeping up with it and we didn’t go past the first month. What a shame! I am going to do better for the upcoming year! Book It is enrolling homeschoolers (Kindergarten thru 6th grade) for the 2017/2018 school year. Sign up here. Not familiar with the Book It program? When you sign up you’ll receive a kit that will help you keep track of your child’s reading goals. When they have met the goal you can reward them with a certificate for a FREE personal pan pizza from Pizza Hut! (Drink purchase required) In your kit you will receive 6 free pizza certificates – one for every month from October to March. One certificate, per child, per month may be used.